TheAngrySpark: Going to Baltimore Comic Con? Why not take home some zombies? Just head to the comiXology booth (which is #1403) on the convention floor during show hours on September 8th and 9th and you might be walking away with a digital graphic novel. Five hundred e-copies of the 140 page Robert Kirkman classic The Walking Dead vol. 1 are up for grabs at the event. You might want to make with the haste though, these with only 500 download codes on hand, I don't suspect they'll last all that long. 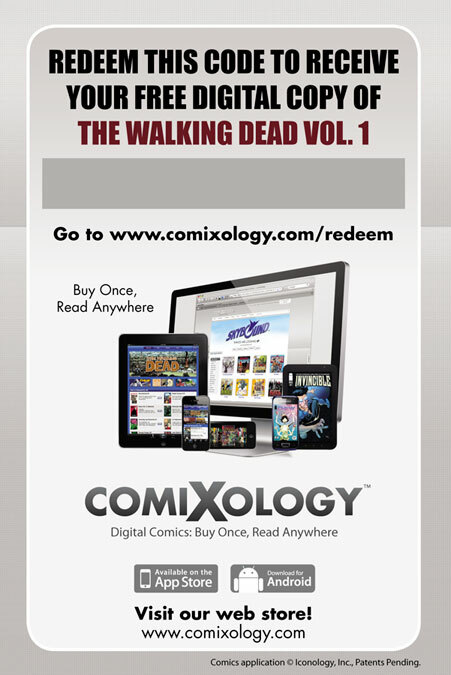 This time around the first 500 Baltimore Comic-Con attendees to come by comiXology’s booth (#1403) will receive a limited edition promotional postcard imprinted with a unique download code redeemable for The Walking Dead Vol. 1 exclusively on comiXology.com in exchange for an email sign up. ComiXology will also be holding a panel presentation at the show. Founder John Roberts, Power Play penciler Reilly Brown, and Valentine creator Alex De Campi will show you the fine art of 'Creating Comics the comiXology way' on Saturday the 8th at at 1pm in room 302/303. Come for the Dead, stay for the learnin'!